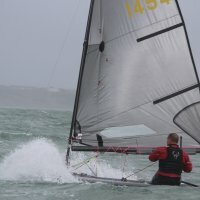 Welcome to the website of the UK's premier single handed racing dinghy. Fast, dynamic, energetic and brilliant - Phantom. Get one or it will haunt you forever! 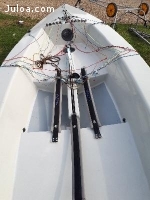 Fifteen boats attended the Phantom Open at Bowmoor SC on the 14th October, 10 visitors and 5 from Bowmoor. It was an overcast day with winds oscillating between 5 and 10 mph with plenty of direction changes. All 3 races got away first time and in Race 1, Olly Hopkins (Bowmoor) was first to the windward mark followed by Jim Hopton (Shustoke) and Dean Griffiths (Bowmoor). It was a close tussle at the front but Jim dropped back when he infringed at the windward mark and had to do a 720. Mike Tustin (Bowmoor) then established a clear lead with Dean and Olly battling for second place. On the last lap Dean went high and was passed by Tom Whittingham (Bowmoor) and Pete Barnstable (Sutton Bingham) who both got a nice gust while Dean was in a wind free area. 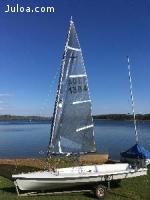 For Race 2 Nick Orman (Castle Cove) got an excellent Start on the pin end and was first to the windward mark followed by Leigh Riddell (Broadwater SC) and Jim Hopton. Jim went into the lead and stayed there until the end followed by Nick and Mike Tustin. Nick was again first to the windward mark in race 3 followed again by Leigh and then Paul Birbeck (Wimbleball). Jim capsized on the first beat and was last to the first mark but recovered to entually take 4th. This time Nick held on to the lead to be followed home by Tom and Paul. With 3 different winners then the final results were close but Nick was the winner with a 1st and a 2nd followed by Mike with a 1st and a 3rd and Jim with a 1st and a 4th beating Tom by the virtue of a 1st from Tom's best result of a 2nd.